AS/NZS 4586 & 4663 are standard test procedures to determine slip resistance characteristics HB 197 assesses relative risk and suitability of surfaces evaluated by the standard test procedures. De facto in-situ test device, the most commonly used. 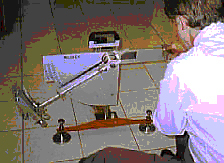 The pendulum is a portable instrument used in the laboratory or on site for classifying the wet slip resistance of new flooring (pedestrian surface) materials. Above photo and video are courtesy of Safety Direct America. Although pedestrian surface materials are classified according to the dry floor friction test, there is no notional interpretation of each class. While there are very few new pedestrian surfaces that would have a dry mean coefficient of friction of less than 0.4, they would make a high contribution to the risk of slipping. However, it would be inappropriate to assume that all products that have high coefficients of friction would make a very low contribution to the risk of slipping when dry. 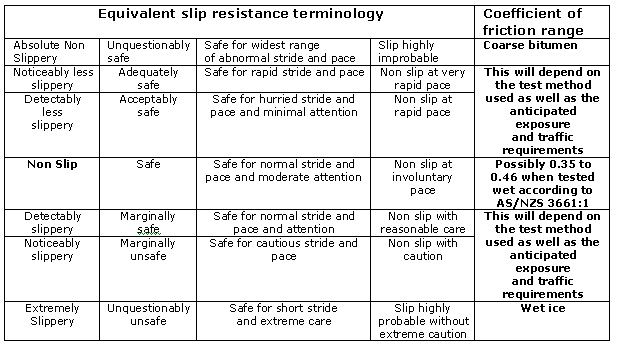 Since slip resistance test methods have inherent limitations, some test methods will be more appropriate for specific circumstances. For instance, since rubber is a poor surrogate for human skin, the wet barefoot ramp test should provide the best indication of slip resistance for areas such as bathrooms. The ramp uses human subjects to subjectively assess the slip resistance of floorings under closely controlled conditions. Ramp testing can evaluate a wider range of products than the wet pendulum test, particularly highly profiled products that are intended to allow drainage or entrapment of contaminants. Methods 1. and 2. are used for testing existing surfaces (in situ), while 3. and 4. are used for classification of new surfaces. So, which test is the best? Two tables Table 3 and table 5 that are really important. Table 3 defines the Minimum Pendulum or Ramp Recommendations for Specific Locations, while Table 5 is a Classification for Commercial and Industrial areas.